Published by Joshua Clare-Flagg on 27 Apr, 2015. We’ve been a supporter of Melbourne Watch Co ever since they launched their first model, the Flinders. It’s still one of my favourite dress watches to wear. 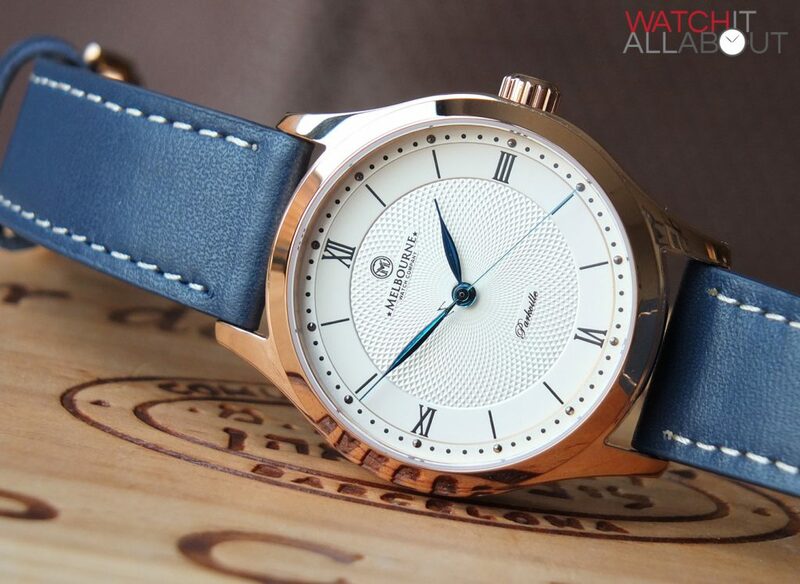 That is, until they released their fourth model – the Parkville. 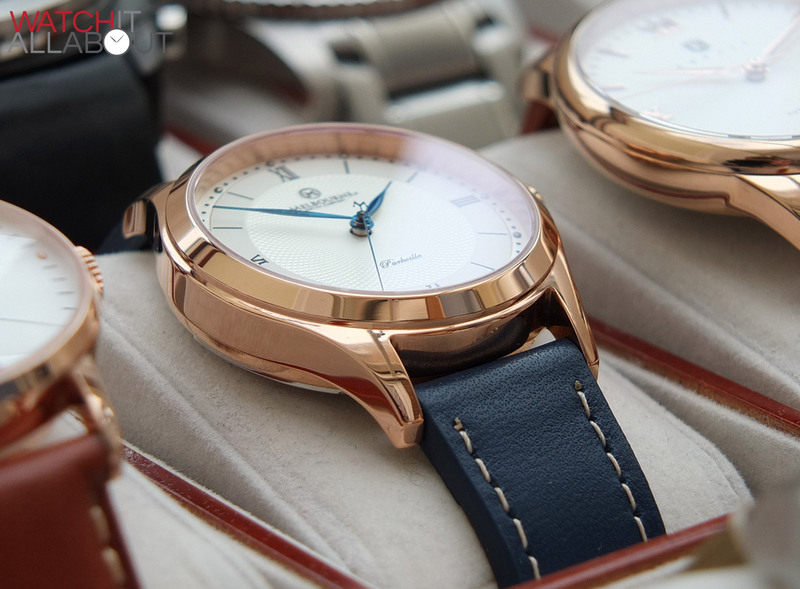 Priced at $465AUD / £240, it’s a reasonably priced offering from a micro brand that has grown from strength to strength and has gathered quite a following along the way. What’s not to like about it? It’s a proper sized dress watch at 36mm (surprisingly hard to come by nowadays), and has a solid Seiko automatic movement, sapphire crystal and a beautiful dial. Let’s look at it closer to see if the Parkville is good for the money. 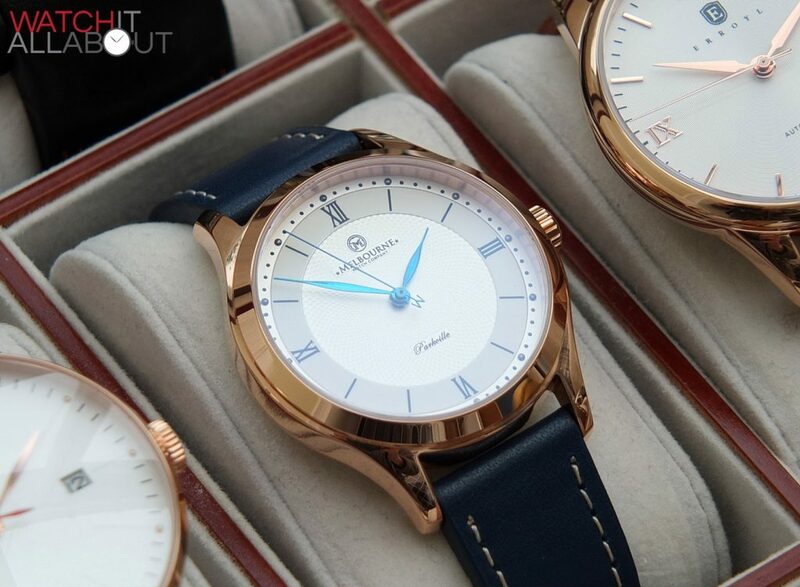 Immediately you’re welcomed by the beautiful polished rose gold plated case, at an elegant size of 36mm in diameter. 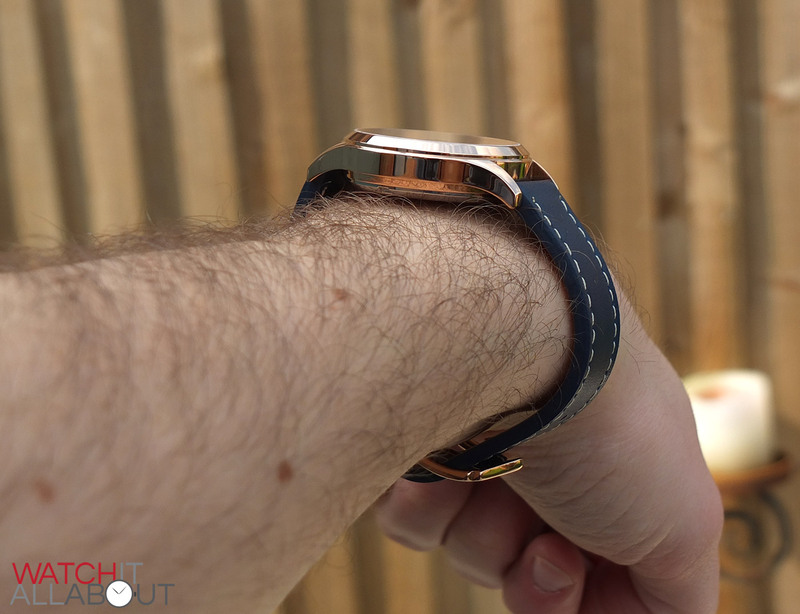 It has a lug to lug length of 43mm, so it really doesn’t take much space on your wrist at all. It also has a height of a mere 11mm, so fitting it under your shirt cuff is not a problem in the slightest. In this modern era, where watches are getting larger and larger, the more traditional size of dress watch is increasingly hard to come by. This, I feel will cause division. 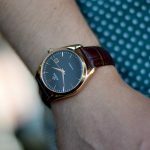 Either you’re more toward the traditional, and therefore approve of the Parkville’s size, or you are a modern watch wearer, in which case the watch it probably too small for your liking. I’ll admit, I thought I was one who much preferred the larger watch. But wearing the Parkville has opened my eyes and I can see that it is a wonderful size for the correct circumstance. So don’t knock it till you’ve tried it. The case is made of 316L stainless steel, and is polished in its entirety. 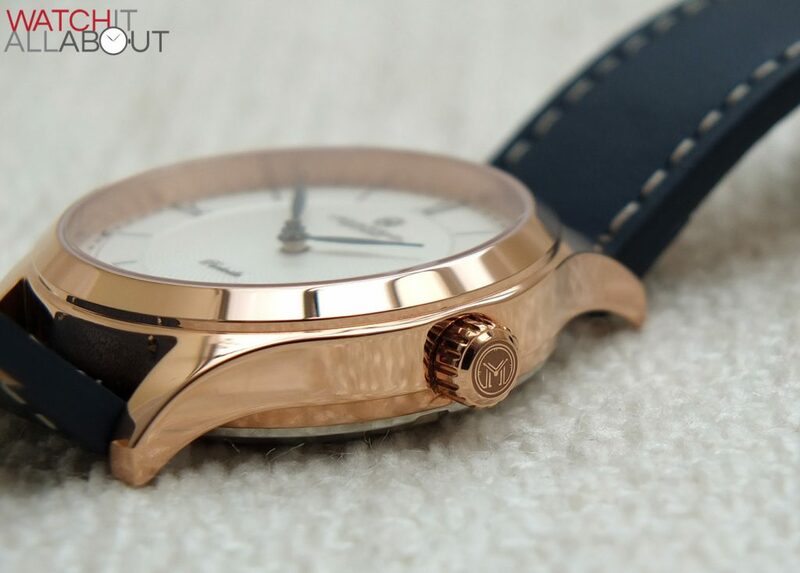 The main section of the case is rose gold plated, whilst the caseback remains standard stainless steel. Whilst this means that there’s no continuation in colour throughout the entire case, it’s not something that’s visible whilst wearing, so don’t let that put you off at all. In fact, it’s a very nice caseback in its own right. 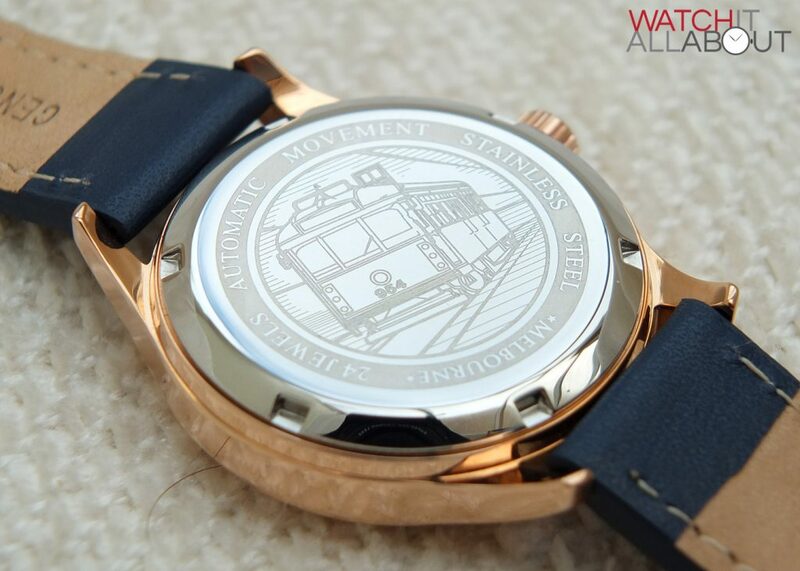 The stainless steel caseback features an attractive drawing of a W-class tram, which were constructed between 1923-1956, with 38 currently in service in Melbourne itself. They’re known to be a cultural icon, and are actually classified by the National Trust. 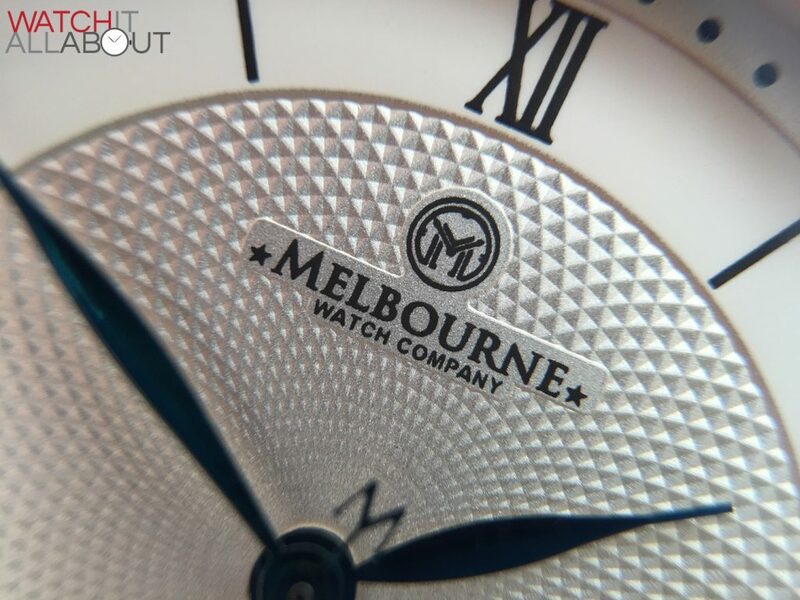 So they are fitting to be used by Melbourne Watch Co on the Parkville, who like to dedicate a lot to their home city on their watches, which is commendable. 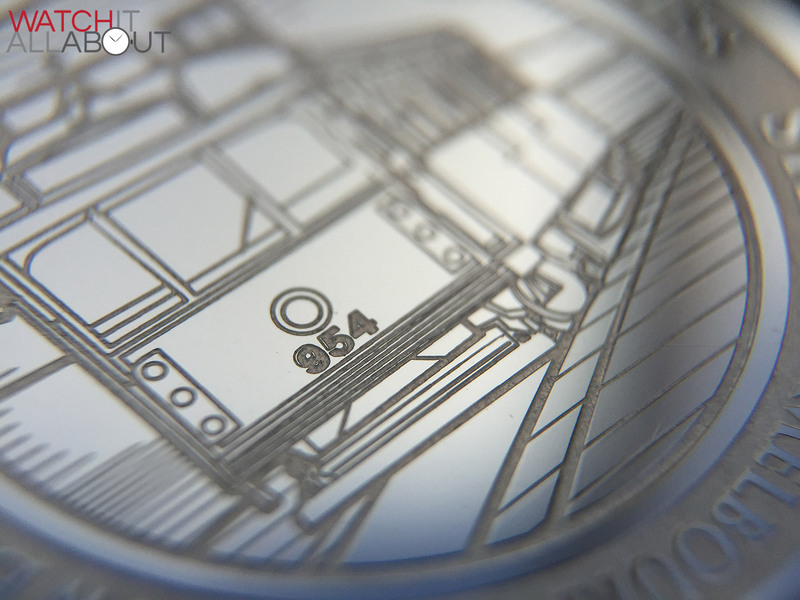 It’s a screw-in caseback, and the engraving is all deep and precise, even through it is quite a complex image. 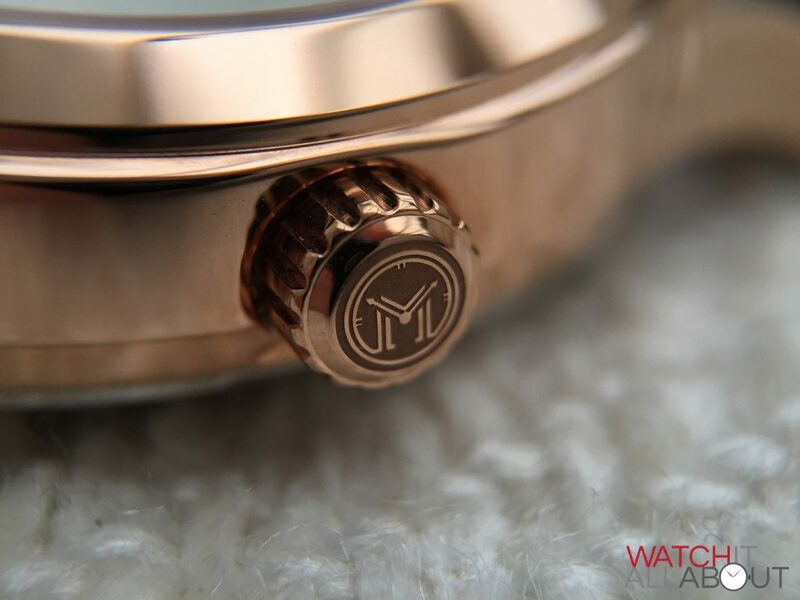 Surrounding the drawing is various watch specifics, such as the jewels, “automatic movement” and “stainless steel”. 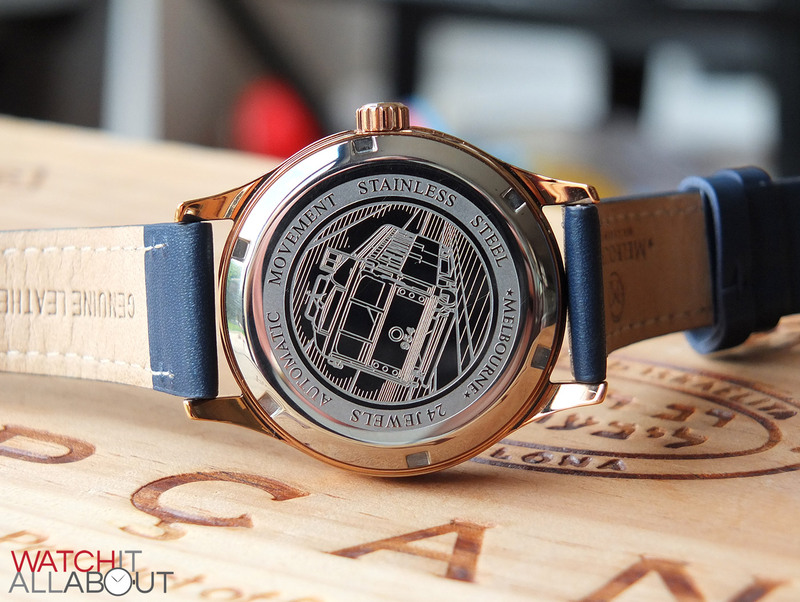 All this writing is fine and accurately engraved, and makes for an attractive caseback. Sitting on top of the case is a gorgeous sapphire crystal. It’s flat, and has a stunning layer of anti-reflective coating on the underside. This offers an excellent level of clarity and is also very effective at reducing reflections. 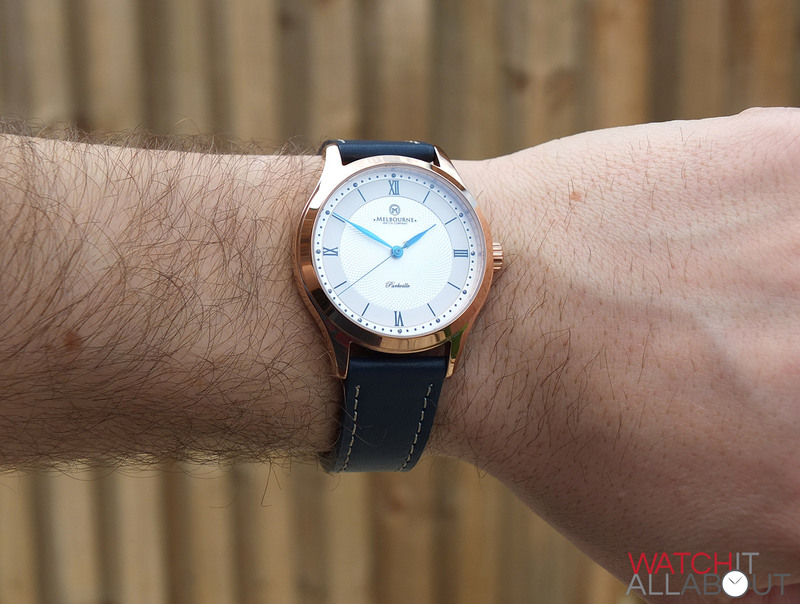 It also has a pleasant blue hue to it, which suits the hands and strap well. To me, this really sets off the entire watch well. The Parkville has a water resistance rating of 30m. This means it’s not really designed to be fully submerged under water, unless it’s a very brief immersion. It will be able to handle getting splashed by the rain, or by water from you washing your face for instance. To be honest, I don’t think this is the kind of watch that you’d submerge anyway, so just be careful with it around bodies of water. The crown is push-pull, and can sometimes be a little hard to pull out. The only way you can pull it out is by getting your fingernail underneath it. Although this mean that the join with the side of the case is close and neat. 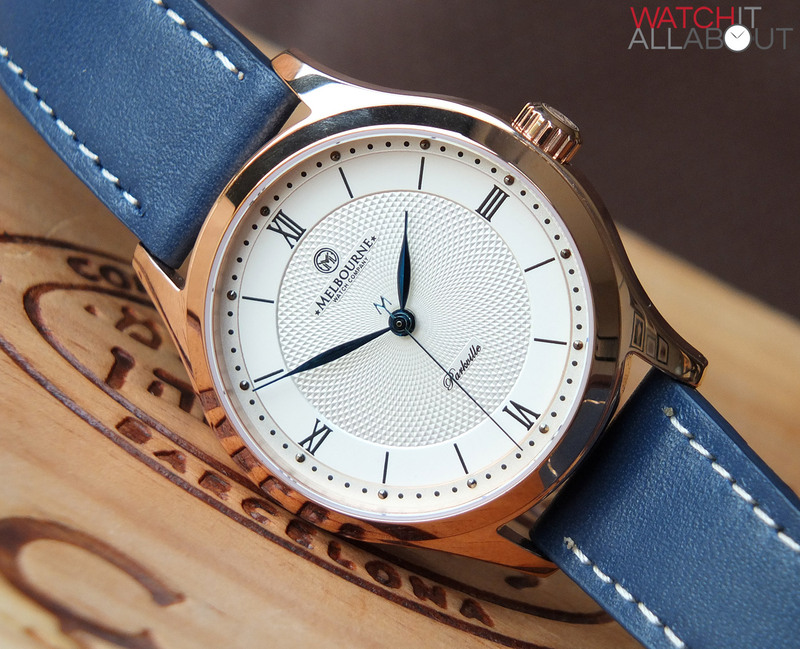 It has the usual Melbourne Watch Co logo etched in the end, which looks good and fits pleasingly. The grip is not too harsh, but is perfectly fine for use whilst setting the time. The lugs are 18mm wide, and have a very elegant shape to them, swinging down from the main case in an attractive smooth sweep. 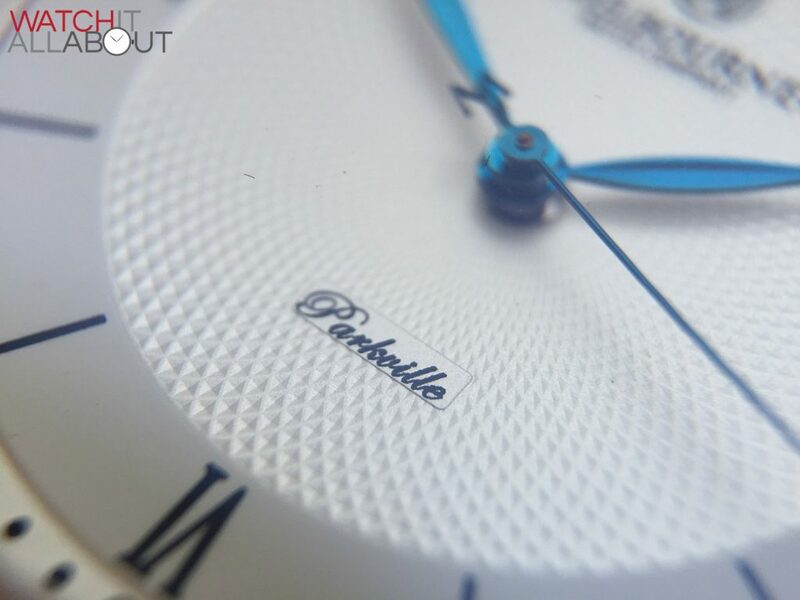 Although the case is small, they work well to keep the Parkville close to your wrist, offering a good fit for all sorts of wrist sizes. The case is extremely well finished. The polishing is all completely immaculate, and the machining in general is also pristine. 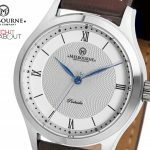 Of course, whilst this shouldn’t put men off, the size also means it’s well suited to be a woman’s watch too – a wise choice from Melbourne Watch Co. 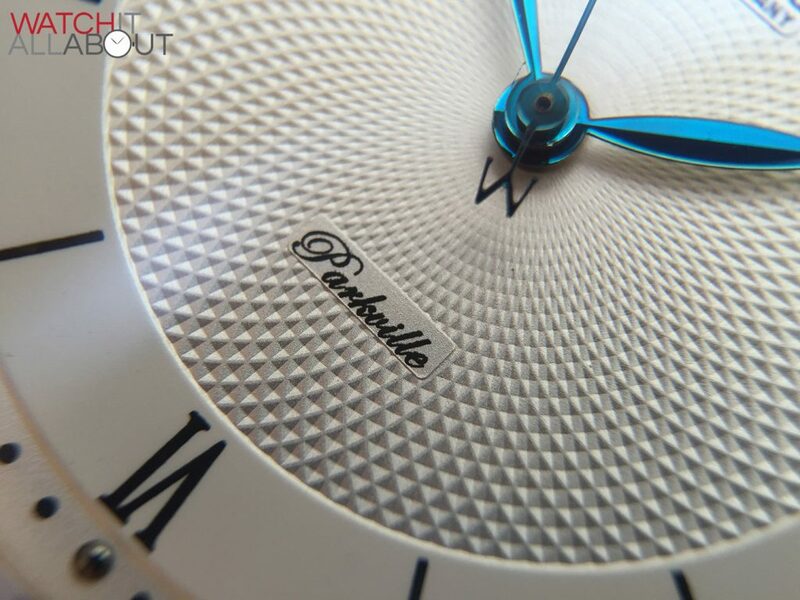 The dial is clearly designed with elegance in mind. The main feature that catches my eye most is its rosetta spiral guilloche pattern, which is remarkably well done. 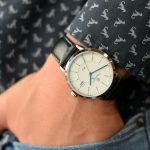 The pattern is stunning to look at, and I also like how it’s not over the top – it’s a subtle texture that doesn’t detract from the dial at a quick glance. On top of this pattern are the Melbourne logo and “Parkville” on their own platforms, to be able to have a flat level to print on. These are both printed delicately and with precision. There are three main elements to the dial; firstly, the pattern, which is then surrounded by two more rings. They are all the same luxurious-looking platinum colour. Outside of the inner spiral pattern is the first outer ring, housing the printed Roman numeral hour markers. The numbers are an apt design cue as they’re tall and thin, stretching the height of the ring itself – imparting an impression of elegance. Surround this, and on the very outer edge, is another thin ring. This contains the minute track and some rather attractive hour markers. The minute track is printed dots, so fairly simple, not busying up the dial. The hour markers are the same “blobs” as can be found on the Flinders. They’re polished rose gold half spheres to match the case, and are surprisingly well made and applied for something so small and delicate. 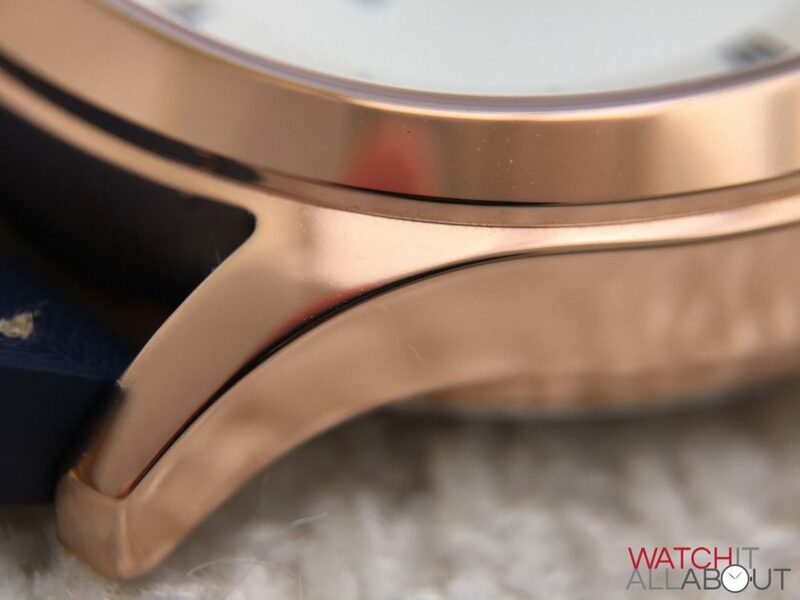 They provide another detail to the dial that’s elegant, subtle and impressive. Moving onto the hands, they’re all blued (most definitely chemically or painted than thermally), which can look black in certain angles. 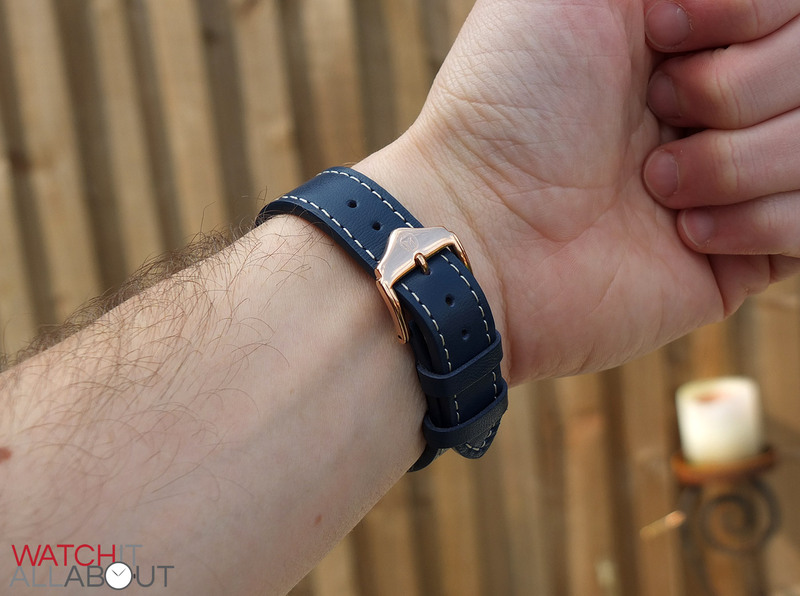 Then, all of a sudden, you get a flash of blue which works excellently with the strap. 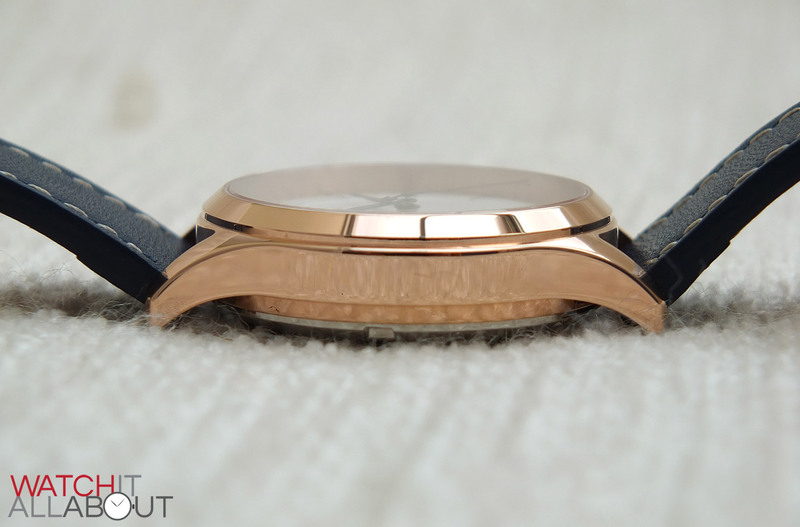 The hour and minute hands are a extremely thin leaf shape, stretching out far and long. Very elegant. The seconds hand is a very thin stick, with another Melbourne Watch Co signature – the M as a counterweight. Some believe that the M is the wrong way around, and that it should read the correct way up when the seconds hand is at 60. But, this doesn’t bother me in the slightest as it’ll only be correct 1/60th of the time anyway, and also I can see why they’ve done it this way due to where they have to make the join (to the base of the middle dip in the M). In any case, the hands are all very graceful and well made. 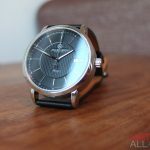 The dial is extremely well designed, and along with the Portsea, I think MWC have made their best watches yet. It’s clear that Sujain (the owner, who designs every watch) has learnt a lot and continues to improve, which is great to see. 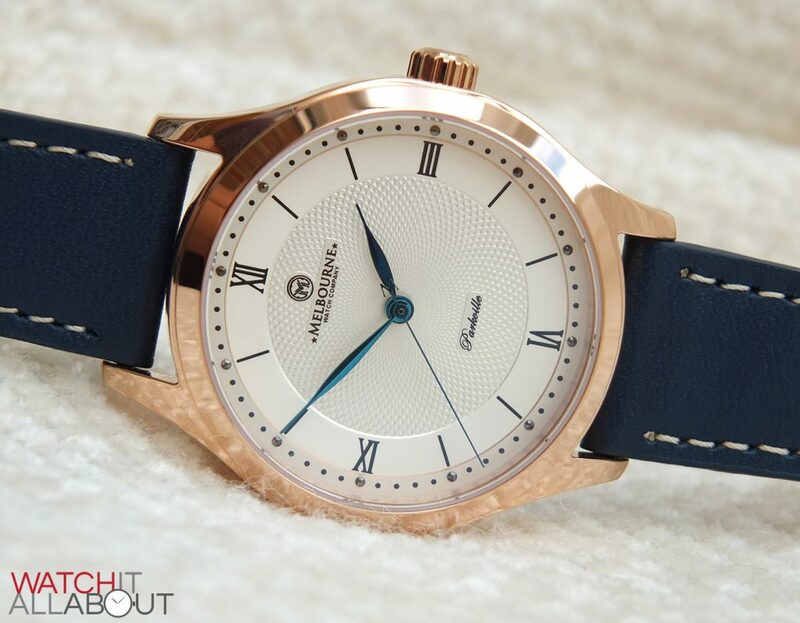 It’s all excellently manufactured, and in my eyes this smart, classic watch is made by the elegance of the dial. The movement powering the Parkville is the Seiko NH35A, one that’s starting to find its way into a few affordable automatics. There’s no surprise why – it’s well regarded as being an upgrade to the already mighty impressive standard Seiko workhorse movements, with the addition of extra functionality. 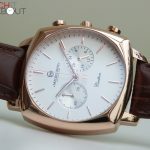 It boasts 24 jewel, a beat rate of 21.6k bph (6 ticks per second), and 41 hours of power reserve on a full wind. It also supports being wound up from the rotor spinning both ways, clockwise and counter-clockwise, so it’s quick to wind whilst wearing it. The added features on top of the standard Seiko workhorse movement is the hacking seconds hand, and hand winding ability too. All these things make for a decent, solid, dependable movement that won’t let you down and will do all you need it to do. 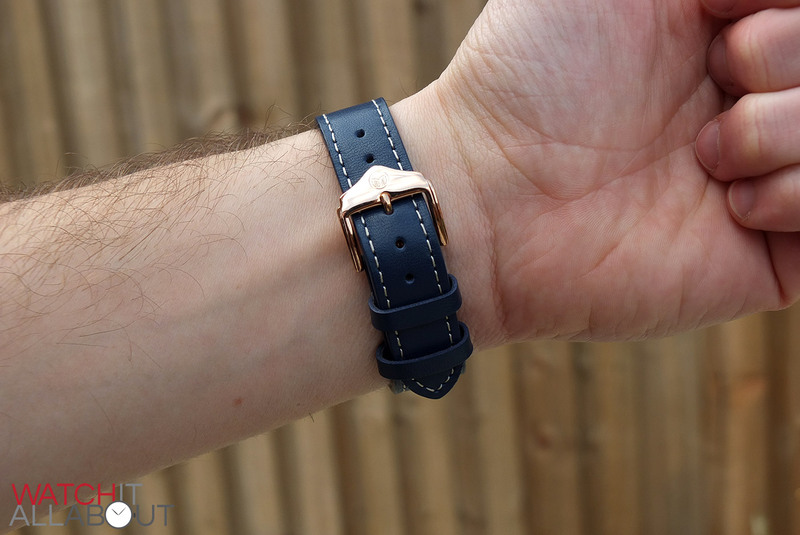 The strap is suitably sized at 18mm wide at the lugs, reducing to 16mm at the buckle. I’ll admit, I haven’t worn many watches at all this small so it took a little getting used to. But now, I realise how well suited and correctly sized it is for smart wear. 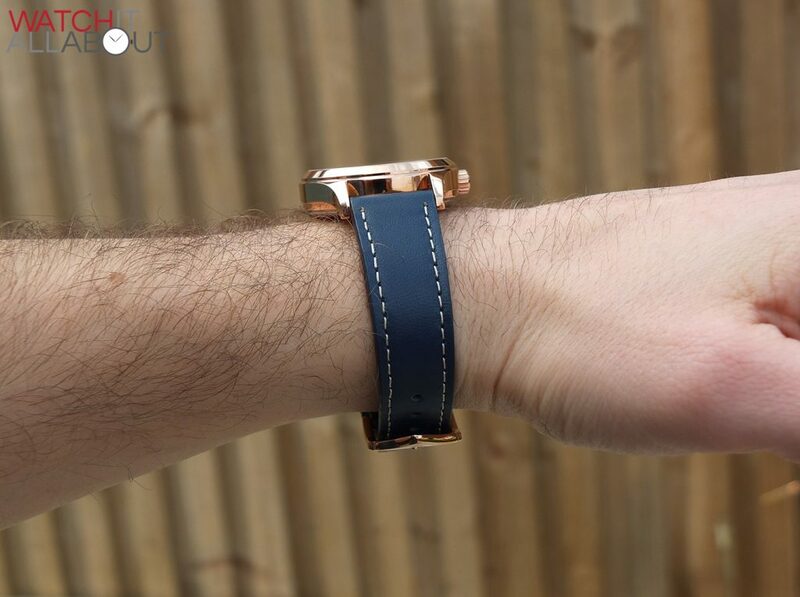 The thing that really catches your eye is the blue colour of the strap. Definitely something you don’t come across everyday but it really works. You may think that the colour restricts what you can wear the watch with, but I haven’t found this to be the case. The colour isn’t a harsh or bright blue, but rather a luxurious, dark blue that is subtle. 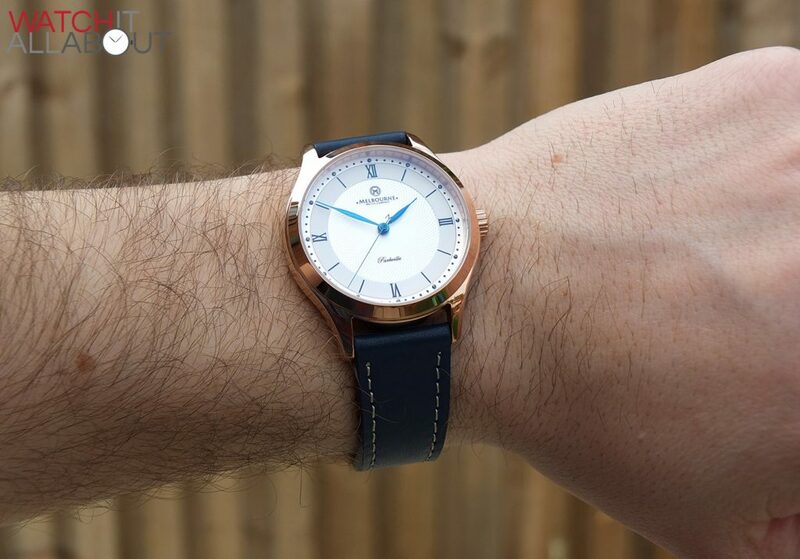 It matches the blues hands to a tee, and creates a lovely contrast next to the rose gold case and buckle. The leather itself is soft enough to be acceptable at this price range. 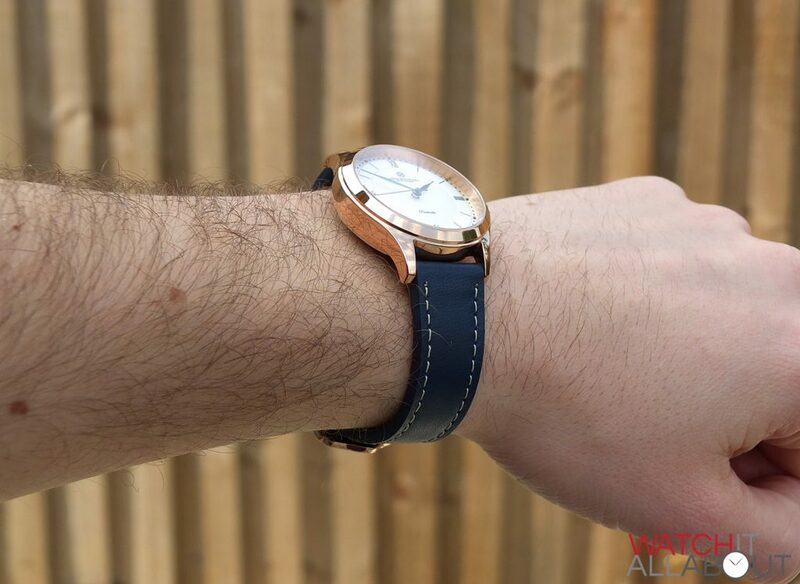 It’s not mind-blowingly good quality, but it looks the part and is comfortable on the wrist. The stitching is all decent quality and well done, creating a distinction between itself and the leather thanks to its champagne colour. Whilst it’s obviously well put together, the stitching is thin, elegant and delicate which is well suited to the watch as a whole. 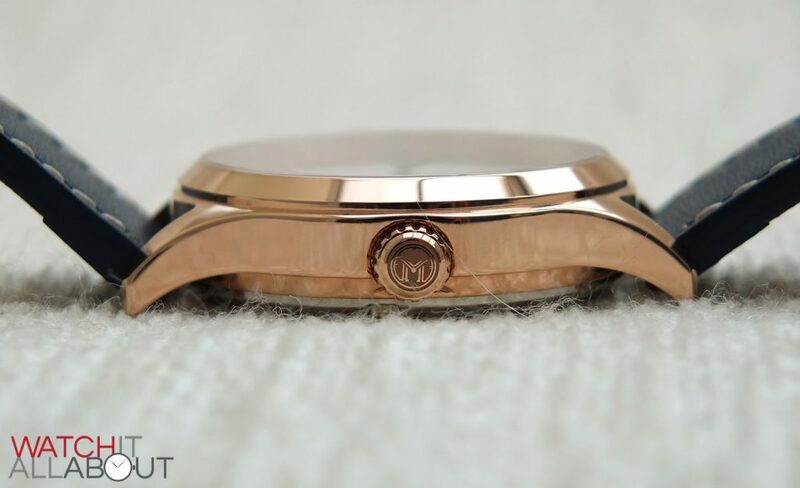 The buckle is polished rose gold to match the case, and is the classic Melbourne Watch Co shape – having the distinctive bulge to necessitate the logo in a suitable way. I like it, as it’s a little different and more shapely than a standard flat bar across the front. 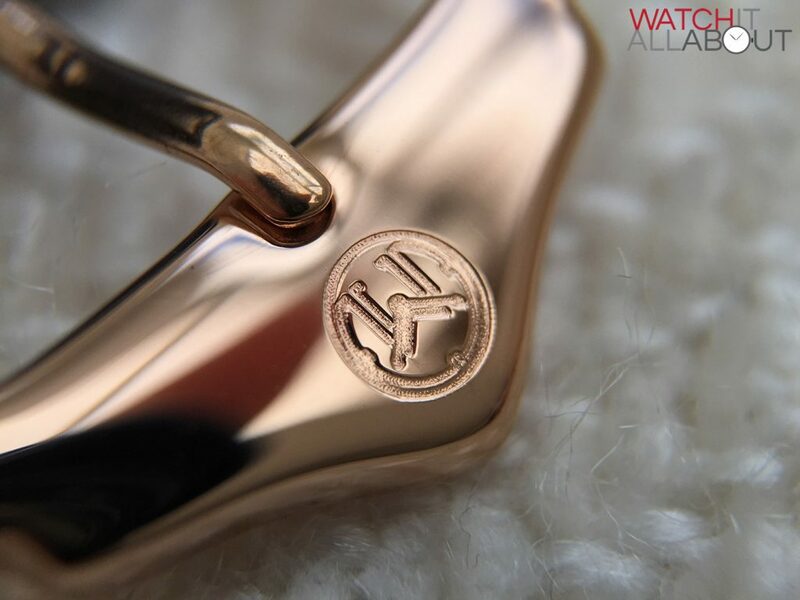 The logo is deeply engraved with reasonable accuracy, and the buckle is flanked by two indents either side to keep things interesting. The polished finish is all mirror-like without blemish. 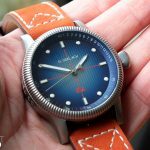 I’ve always said that I like the effort that’s been put into Melbourne Watch Co’s buckles, as it’s not easy making something so simple that little bit different. 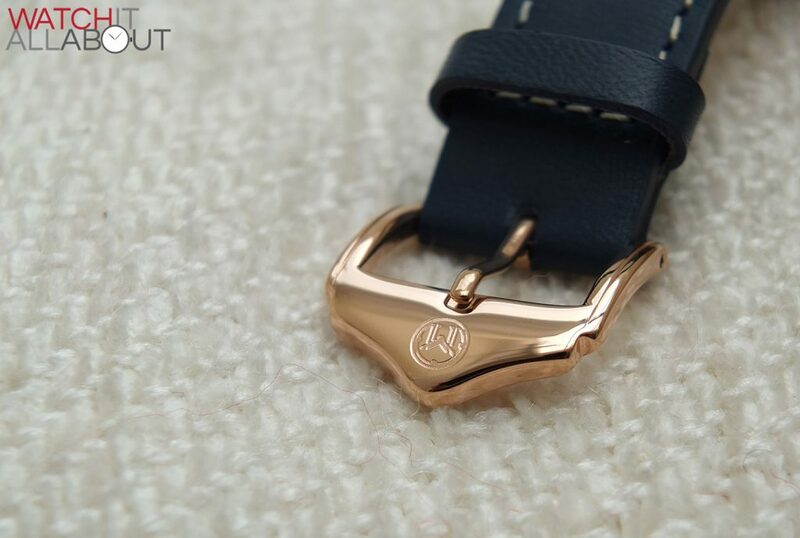 It’s a decent enough strap, that is suitable quality, and will please you in the looks department thanks to the colour. 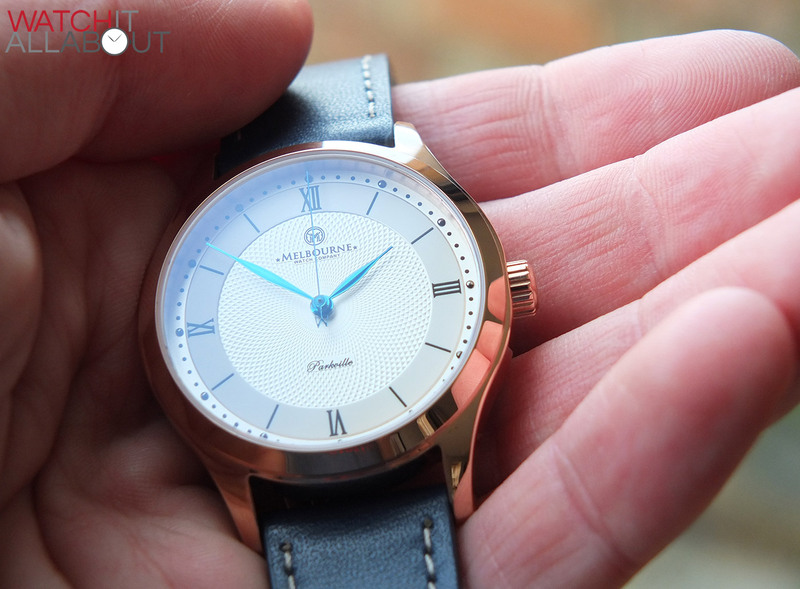 I believe that the most important characteristic of the Parkville is its size at 36mm in diameter. Therefore, the competitors for me are similar sized dress watches. I’ve reviewed a couple that can be classed as alternatives. 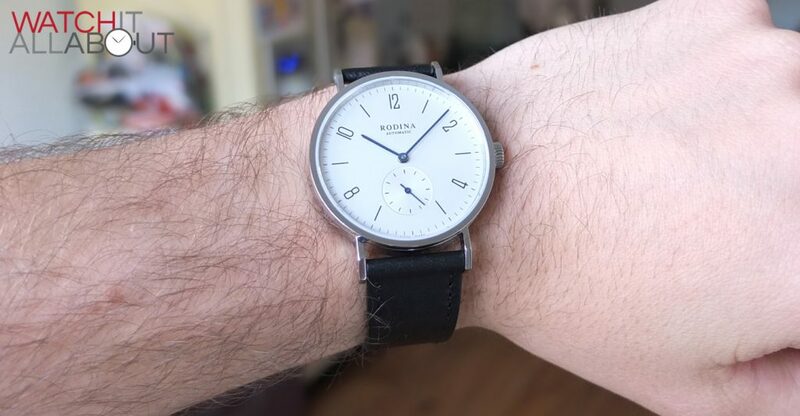 Firstly, there’s the Rodina R005 Bauhaus homage. Costing only $120, it’s 38mm in diameter and very classy in design thanks to the Nomos it’s heavily based on. Well made with good specs for the money definitely make it a viable equivalent. 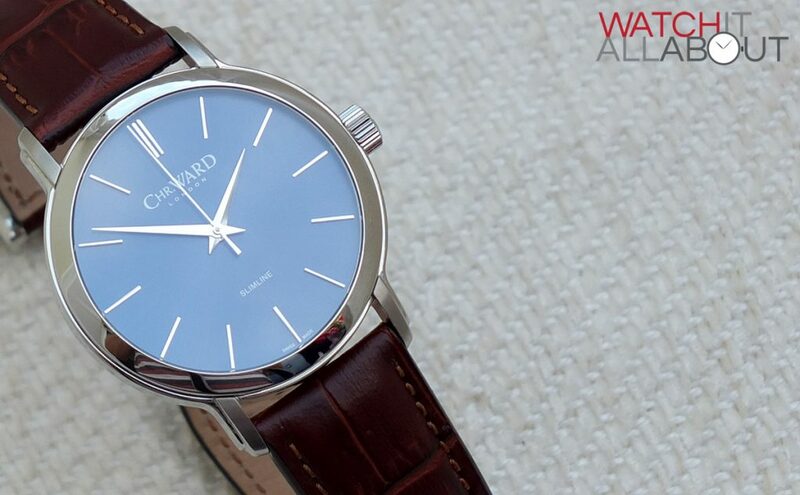 Second, there’s the Christopher Ward C5 Slimline. A little larger at 40mm, it’s super thin at only around 8mm. It’s also very smart, Swiss Made and I think it’s a steal at £400. 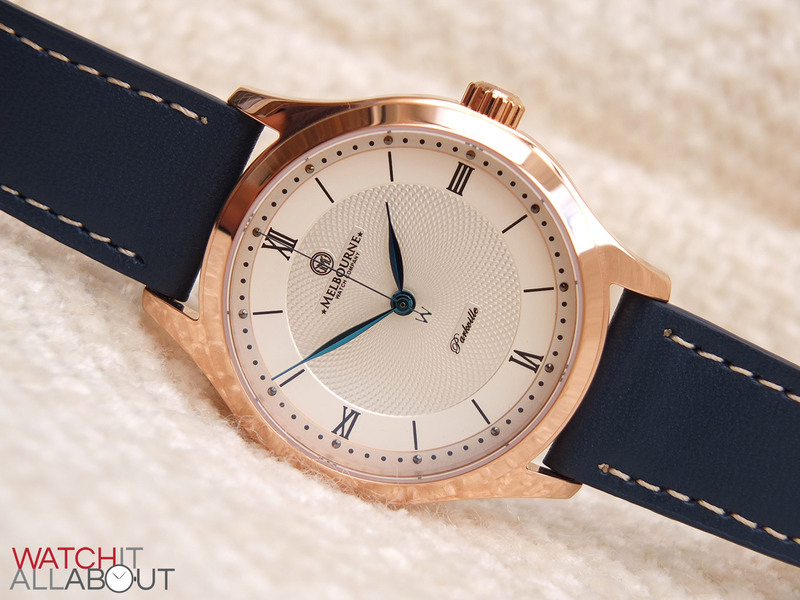 36mm is quite an unusual place for a small boutique watch brand to go. You’d expect them to go for a size which will sell the most and will appeal to all – around 40mm. 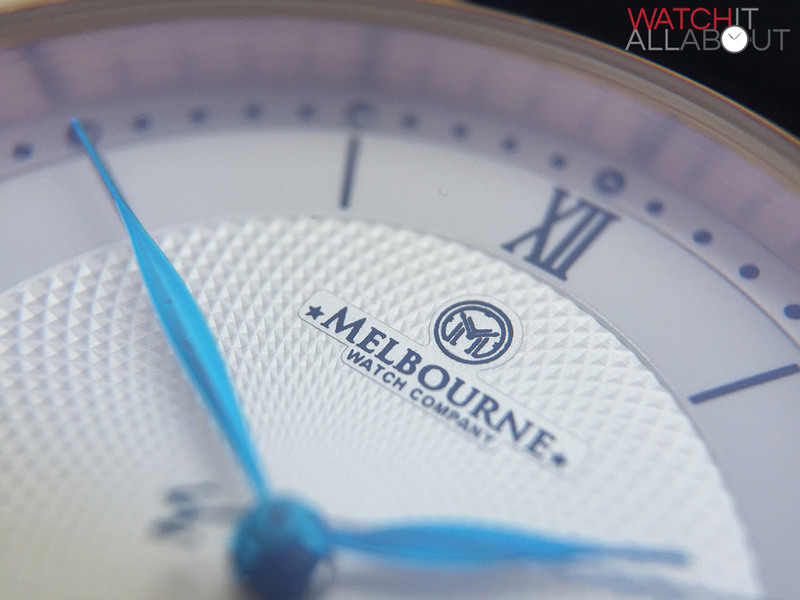 But I’m glad Melbourne Watch Co have gone for it. They’re making the most of a niche market here – dare I say it – a unisex watch. Don’t let that put you off at all, I just mean that it’ll look equally as great on a mans wrist than it will on a ladies. 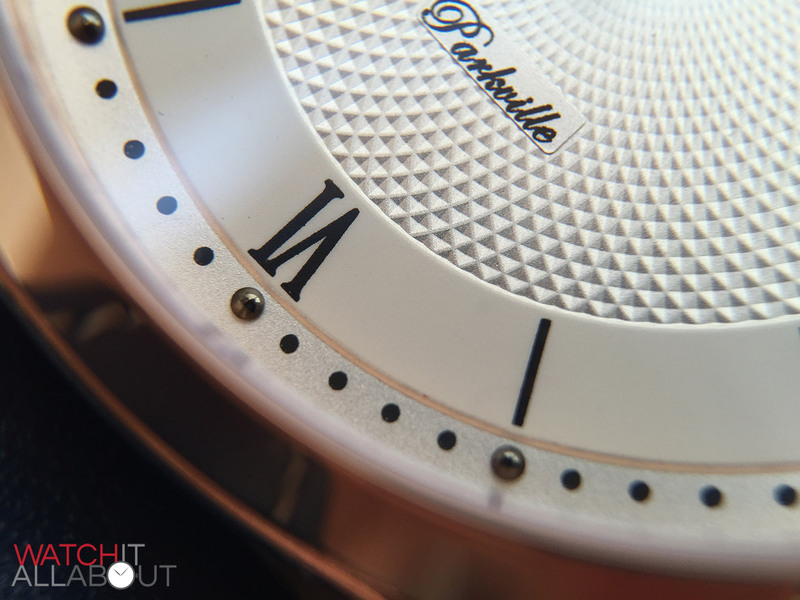 The Parkville is the smallest watch I’ve reviewed yet. I was a little apprehensive at first, but I’ve completely come round to the size – and how it is, indeed, an excellent size for smart dress. I believe the Parkville is wonderfully designed, striking in appearance. But not only that, it’s very well made and has a high level of fit and finish throughout. Don’t forget it has a two year warrantee, and that you’re also supporting one of the best and nicest newbies in the business (that’s Sujain). I’ve had a decent amount of comments whilst wearing the Parkville, so it’s definitely an eye-catcher. 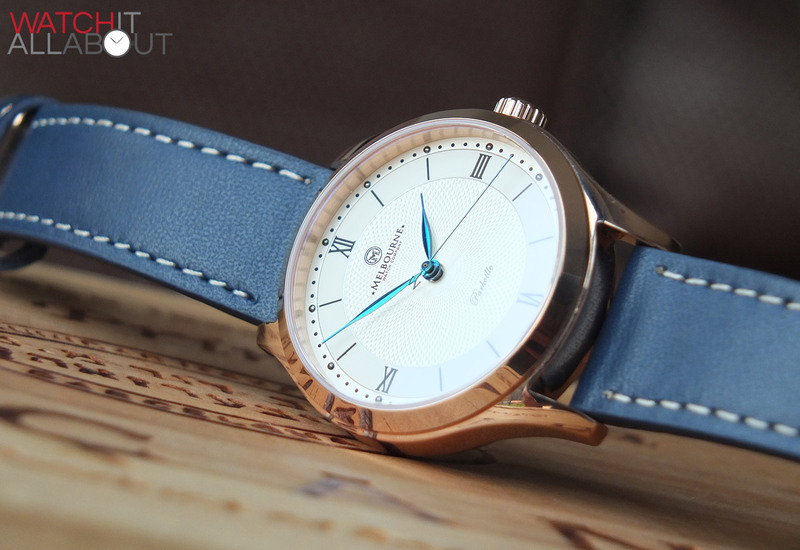 If you’re in the market for a dress watch, then do not fail to consider the Parkville. Melbourne’s doing great work and every watch they make is a testimony to this. Planning to buy a Carlton when it’s released. Another very attractive piece from the Melbourne stable. I’m impressed that they can do it for the price they ask. Most impressive. how do you compare the Rodina against the Rossling & co??? 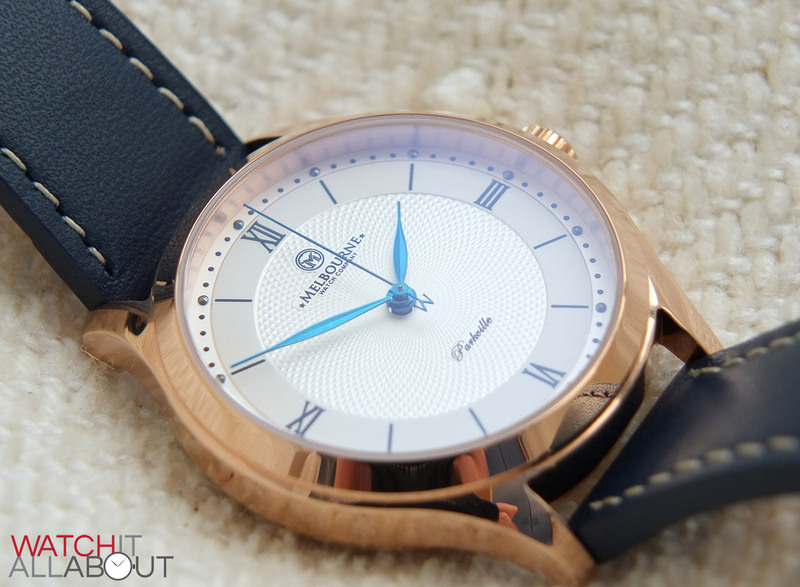 I love the caseback – I know it’s not going to be seen often but it’s a great talking point with other watch lovers! This is listed as a ladies watch on their website. Is this just due to the 36mm size?